Join the #1 Surface Refinishing company! Miracle Method’s unique and affordable refinishing process makes ugly bathtubs, countertops, and tile beautiful again – without replacing. The residential AND commercial demand for our time-saving alternative to replacing old bathroom and kitchen fixtures is skyrocketing. #1 in Surface Refinishing – the largest footprint in North America! We continue to set sales records, including a 70% increase in sales in the last 8 years. Turns out, people like saving money, especially when upgrading their kitchens and bathrooms. Since 1979, over 1,000,000 homeowners and business have chosen Miracle Method for our money-saving alternative to the mess of replacing old bathtubs, countertops, and showers. And the mainstream awareness of our unique product has only just begun! 1) Residential Surface Refinishing: Repairing & refinishing bathtubs, showers, and countertops in homes. 2) Commercial Surface Refinishing: Nearly 40% of our revenue comes from hospitals, universities, hotels, assisted living facilities, and other commercial accounts. 3) Bathing Safety: A complete Bathing Safety offering to the elderly and caregivers alike. There is no limit to the size or level of success a franchisee can grow their business. Within our franchise network, we have several locations exceeding $1 million in annual sales, and some surpassing $2 million – and they all started with our comparatively small investment of $85-$125K. 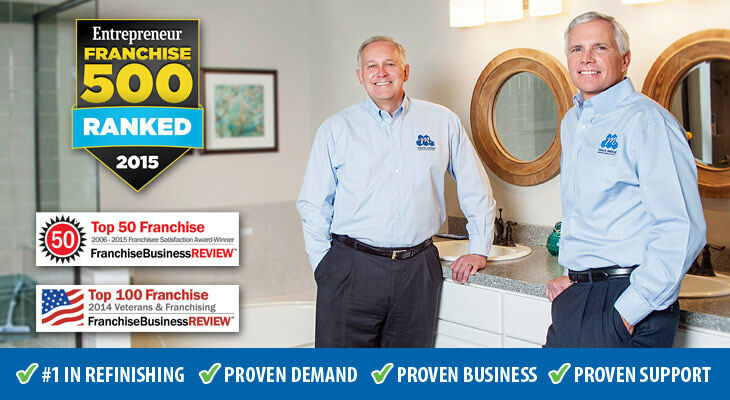 We offer our franchisees an unmatched level of support and training. There is no other program like it in the surface refinishing industry. From our initial 20+ days of “immersion training” to our ongoing support, we help you profitably grow your business. Highly Motivated and Driven to Succeed? Let’s talk! We are selective in who we choose as our franchisees. Our ideal candidates are motivated, able to follow processes & procedures, and can manage a business. If you have the drive and discipline to grow a business, then we want to talk to you. Take the next step – right now! Please call John Tubiolo directly at (877) 434-5096. Miracle Method Surface Refinishing is currently accepting inquiries from the following states: Wyoming, West Virginia, Wisconsin, Washington, Vermont, Virginia, Texas, Tennessee, South Dakota, South Carolina, Rhode Island, Pennsylvania, Oregon, Oklahoma, Ohio, New York, Nevada, New Mexico, New Jersey, New Hampshire, Nebraska, North Dakota, North Carolina, Mississippi, Missouri, Minnesota, Michigan, Maine, Maryland, Massachusetts, Louisiana, Kentucky, Kansas, Indiana, Illinois, Idaho, Iowa, Hawaii, Georgia, Florida, Delaware, Washington, D.C., Connecticut, Colorado, California, Arizona, Arkansas, Alabama, Alaska.